This N63 came in with check engine light on,,,the fault was bank 2 intake vanos during cold start,,,,so the vanos unit wasn’t working properly during cold start operations,,,,performed the test play which operates the vanos units and checks there functioning properly. So what I found during the test is that the vanos solenoid for bank 2 intake was jamming,,,,so to remove the solenoid you have to remove or just loosen and push aside the turbo intake cooler,,,it’s not to bad to remove,,,there are just three bolt holding it in place,,,,one of the bolts is hidden and kind of hard to get to. Once you move the intercooler,,,,both vanos solenoid are behind the intercooler,,,,the one on top is the intake solenoid,,,,,and it’s the same on bank 1,,,,, the intake solenoid on top and the exhaust one on the bottom,,,,removing it is easy just one bolt and pull it out,,,,slide new on in. Here are the old and the new,,,new one on the right,,,,you can see the changed the design a little,,,they added a screen mesh over the holes,,,,so no dirt can clog or jam the solenoid valve,,,,because any little dirt that goes inside can cause problems. 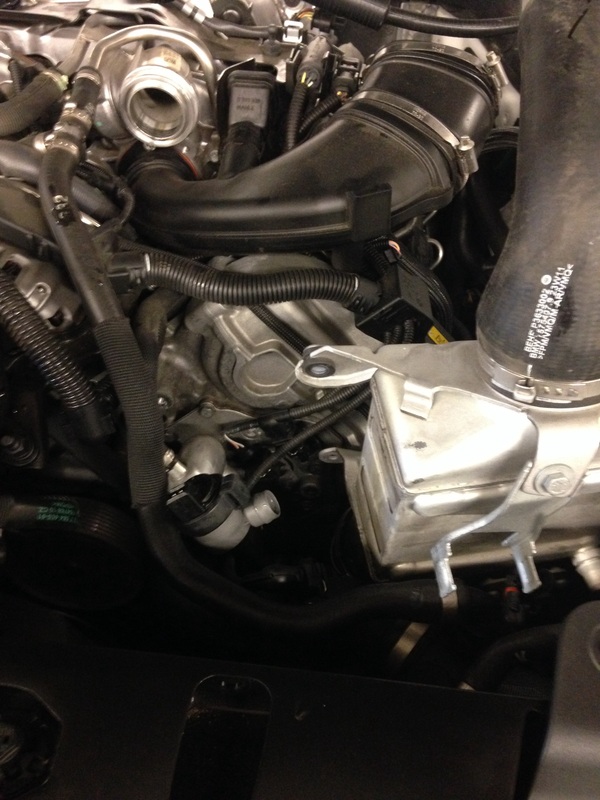 This entry was posted in Uncategorized and tagged intake, N63, Vanos solenoid. Bookmark the permalink. Hi, I have question for you, but wasn’t sure how to reach you, where are you located and can you send me your email address? Thanks! Hi, Thanks for the offer, it’s actually regarding the clicking noise from the wheel bearing and the SIB solution to add grease. Your comment there was that it works 50% of the time, otherwise you usually have to put new hubs. My F01 is having that exact same issue, and the dealership wants to apply that SIB-for $780!! For that kind of money, I’d rather just swap out the wheel bearings myself. If I swapped it out (seems like there is a current part that supersedes the original part, but I’d have to order new bolts since it’s threaded differently), would you still have to apply the special grease or in your experience, a new wheel bearing takes care of the issue entirely? Finally, I’m in Long Beach, CA and I’m also a Board Moderator for Bimmerfest.com, in case you’d like some referrals, etc. I’ve found your posts to be very informative! Thank you so much, I will do that instead. You can find me in Bimmerfest as user AOM feel free to PM. Yes I think it was dirt,,,but also this car had low miles 16k on a 2013,,,,sometime I think the car wasn’t driven hard,,,,and things start to gum up inside the engine when it sits. Just wanted to say that I replaced the wheel bearings. Following the repair guide, I torqued the new bolts to 20nm, then 120nm. I also torqued the pivot arm bolt to 100nm. That was tricky since it wanted to keep spinning, so I gently jacked up the wheel assembly, which then allowed me to torque it to spec. I did not use any threadlocker since no one suggested it (and it wasn’t included in the repair guide). So far, have placed 100 miles and it’s super quiet, no clicking sounds and cost me less than they wanted for just applying the grease. Thanks again for your input, I really appreciated it! So what size is that third hidden bolt. I think it is beyond a little tricky but maybe it is just not my day. All three of those bolts are 10mm head bolts,,,,this is hard to explain,,,the one hidden bolt is really hard to find,,,,it is almost tucked under the inner cooler and is set in deeply,,,look for a 10mm head bolt with a big washer on it,,,,if you have a mirror,,,,that might help to see it. I have a same issue but with exaust solenoid. 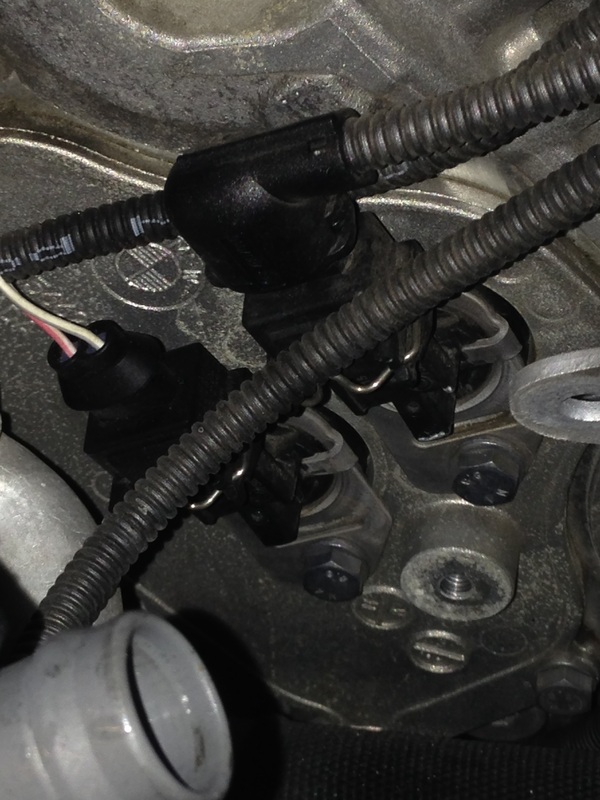 130308 Vanos, outlet control error, position not reached. 130408 Variable camshaft timing control (vanos) exhaust, cold start not controllable. I need a pro here for this. I have a 2012 BMW 750i Xdrive. It has 29k miles on it. I recently started having an issue with 130308 code constant with checkengine light. The 130408 only poped up once. I have a snap on scanner that’s the codes that shows. The car would drive normal then it would save drive train malfunction and the car would be half power on the engine very poor acceleration. Sometimes couple days it’s all fine and one day it will do it all day. The cold is there all the time but drive train my function pops up sometimes and some days it drives fine. Change the oil in a seems to be a bit better but next day back to square one. 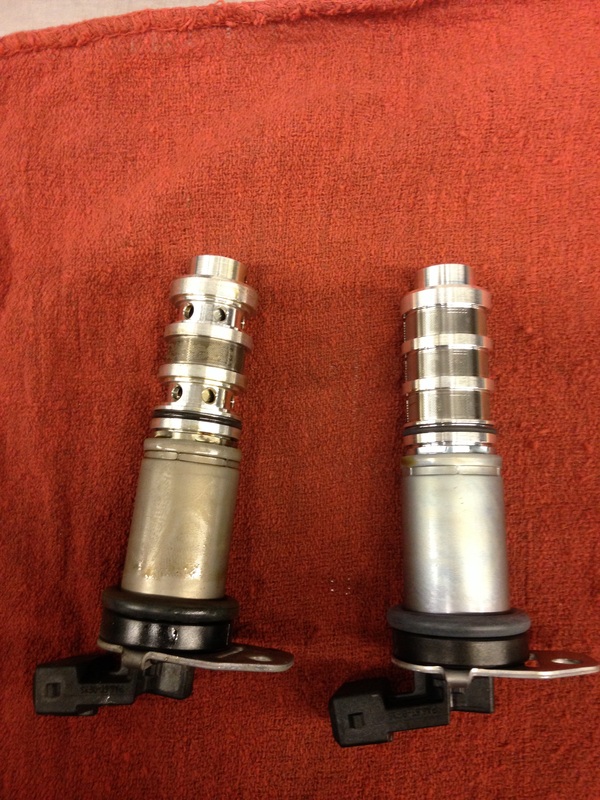 So I have got 2 updated solenoids I have replaced 2 exhaust solenoids. Not the top ones the bottom ones i will Attach pictures. I thought it’s gonna go away but it’s the same crap. What can I do? If it would be mecanical it would be constant but some days it’s drives fine . I need to know are the bottom solenoids for exhaust.? Or do I have to change the upper ones also? Also what can I do to get rid of this problem it’s very annoying and I cant drive normal. Nice car but a biggest piece of **** i ever owned. After updating the pcm software to the newest update i only get 1 code now with the cold start and it drops the car in to drivetrain mulfunction. 130408 Variable camshaft timing control (vanos) exhaust, cold start not controllable. What else should i do? I allready replaced the soleboids the bottom ones for exaust. hi and thank you for your post with pictures it gave me the confidence to change my vanos solenoid on drivers side i was getting exhaust fault ” 130308 VANOS, exhaust: control fault, position not reached and 131408 Variable camshaft timing control (VANOS), exhaust, cold start not controllable” i change both solenoids on drivers side only. but before installing i dipped them in seafoam because before finding your blog i pour some seafoam into engine oil and it drove fine for a couple miles but check engine was still present. also this vanos error happened after driving the car with no to low oil to my indy mechanic shop after noticing the line from my oil cooler was leaking. basically im wondering did i clog the new solenoid with seafoam is that why its still a error, does the adaptions need to be reset “dme ram back up”, or is my vanos sprocket messed up. i checked the timing on ista+ and it shows good. I don’t think the sea foam did any damage,,,I’m just worried about driving with low oil and if the vanos units are damaged ,,,the vanos units are oil pressure controlled. Are the vanos faults you getting still for bank 2 drivers side,,,and does the engine idle normal and does it sound normal,,,or is there a rattle noise coming from the engine.,,,,and what faults do you have. Yes faults are on drivers side, it’s drives fine slight hesitation shakes a bit calms down when it gets warmed up. But imeaditely on start up it says drivetrain malfunction. I’m getting 130308 VANOS,exhaust: control fault,position not reached. 130308 is right side, bank 1. Hello, I too sincerely appreciate your post. I have a 2012 X5 and recently experienced a misfire issue shortly after start up and a few days later while passing at highway speed. On both occasions the engine had a significant miss accompanied with a CEL and reduced power warning. After shutting down and restarting everything seems fine. I received the following faults on both occasions: Vanos Intake Cold Start, Misfiring Cylinder 4….also one that is most likely unrelated….tank level sensor. Considering the aforementioned, do you think the Vanos Solenoid replacement is the right direction to resolve the issues ? Your advice would greatly appreciated. Thanks in advance for any feedback. So very much appreciated. I’ll follow your recommendations and update you accordingly. Thank you !!!!! 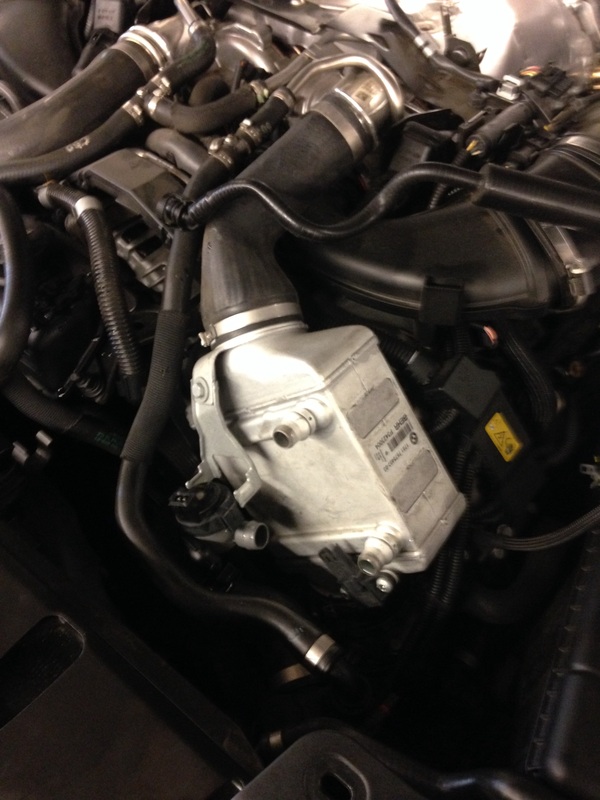 Thank you for your blog, I am having this issue with my 2011 BMW X5.0 with N63 motor, after driving the vehicle when i park it then when i return and start it the car throws a orange CEL i have the carly ODB11 wireless reader and its telling me code 002A7D Engine/motor Vanos, Inlet 2 cold start. but this goes away if i turn the car off and then restart it and it drives fine. Please corect me if i am wrong, this code means that the bank 2 ( driver side (left)) vanos inlet solenoid is acting up and i need to replace it right ? the inlet solenoid is the top one (out of the 2 solenoids on the left side)? I have ordered the solenoid but i figured i am going to add sea foam to the engine to clean the gunk inside and prevent this from messing up my new solenoid,would you recommend this procedure? Don’t add Seafoam as it won’t do anything. These solenoid valves operate off oil pressure. The seals fail and/or the little filters in side them get clogged up. Just change your oil at 1/2 intervals (~7500 miles) if you don’t already do so after you’re replaced the solenoids. Wow sounds like you did a lot of work,,,first I would wait until the check engine light comes on because right now you are just going around in circles try to fix something,,,,but this is what you can do is when it starts to misfire I would check the spark plugs to see which one is fuel soaked and that might be your problem. Ok on bank 2 the drivers side, did you notice any fuel soaked spark plugs when you changed them,,,,you might have to remove them again and see which one is fuel soaked and that will tell you which fuel injector is going bad,,,,if you don’t find any fuel soaked spark plugs which sounds hard to believe because you said you smell ful from the exhaust and smoke coming out of the exhaust tells me you have a fuel issue,,,,if no injectors are bad the next ting would be one of the high pressure fuel pumps or the low fuel pressure sensor went bad causing it dump more fuel into the engine. Has anyone tried the generic aftermarket solenoids? They are a lot cheaper but unsure of the results. The ones I have seen its 50% work or fail. It sounds like the engine timing and vanos are not set right. I used the special tool to set the timing and when you says the venos are not corectly set what do you mean sir? Yes i did the 360 degrees turn nd re-checked everything.i hve one more concern abwt my special tool it doesnt have a preload for the tensioner i just loosened the tensioner before tightening the vanos;30NM and 90 degrees.have i done it the right way sir? No this is what you eyed to do,,,,pin the engine at TDC then you have the vanos units bolted on but not tight,,,,you have the vanos unit slightly loose so they should be able to move,,,you should have the camshaft locked down,,,,then you tighten the tensioner all the way in until it’s tightened down,,,,then you tighten the vanos unit to the tighten torque,,,the engine should be timed,,,turn it 360′ and re-pin and lock out the camshafts again to double check,,,,,once you get it running,,,,drive the car normal sometimes it takes sometime for the vanos units to get enough oil pressure and start to work properly,,,,remember everything has been dry of oil for sometime. I’ll double check about the calibration. They did do a compression test and the numbers were good. My mechanic said, The Vanos degrees, both cams, driver bank do not move and they are mega high. There no codes though for a faulty Vanos. Just the misfire codes. The misfires are just for Cylinders 5 and 6 correct?,,,,if the vanos unit don’t move how does the mechanic know that , the vanos units are mechanical,,,,also if the vanos units are faulty then you would have vanos unit faults,vanos solenoid faults,timing faults and the whole bank 5,6,7 and 8 misfires,,,,,you only have misfire cylinders 5,6 that doesn’t make sense. The bushing are in good shape, we checked the valves with a camera (from what we can see they are fine).. Yes it really doesn’t make any sense,,,,when the mechanic runs the test for the vanos does bank 2 vanos retard and advance?,,,,I just don’t like how cylinder 5 and 6 have misfires,,,,with the misfires could cause vanos problems. Sounds like you have a couple of problem,,,,misfires and vanos units,,,,you need someone who really knows that engine to see what’s going on with it. Please help. Recently bought a used car with 80K on it… few months of driving it, less than 10K, and I get Drivetrain Malfunction: Drive moderately. Maximum drivetrain output not available. I’m clueless as what to do. Any help would be appreciated!